When we pick up a modern tool rarely do we consider how it is made. In the past it was sometimes a major undertaking. A looped palstave axe was at the leading edge of tool design in the middle to late Bronze Age and reconstructing one presented some interesting challenges. The bronze head would have originally been cast in a two part stone mould. This example was made by lost wax casting but remained identical in all other respects. 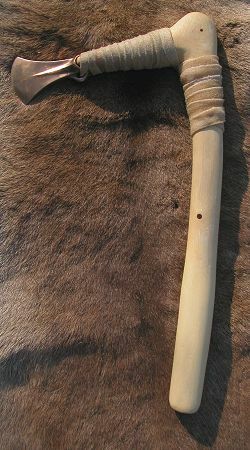 The original toolmaker would have to proceed with an axe to trim the branch to the required length. In order to reduce the risk of damage to my hard won stick I cheated badly here and used a saw. I had no idea it would prove so difficult just to find one suitable piece of wood! I set about from this point to not cheat again and most of the smoothing and shaping was done from this point on with a flint scraper and bronze blade which proved every bit as useful as an iron knife when working with wood. It just needed more frequent sharpening. Having shaved away the stick down to the heartwood I was faced with the next problem. The bronze head sits in a shouldered cleft in the shaft. This would be very difficult to achieve without recourse to the saw once again. Bronze saws were not unknown at the time but I suspect they were not a common item compared to an axe for example. The alternative seems to be a delicate whittling job with a small blade perhaps with the help of a bronze gouge for which there are reasonable number of finds. My respect for the ancient toolmaker rose another notch as I chickened out and reached for my saw again. I consoled myself with the fact that a least it was an Iron Age style saw and not a modern one. The next bit would be easy I thought, the head would be bound on with rawhide so I pinched a couple of Skadi’s dog chews and started soaking them. Not for me the job of hunting, killing, skinning and scraping that my ancient counterpart would have needed to do for a bit of rawhide. the problem of course is that it is difficult to get a long piece from a dog chew but with a bit of clever cutting I had a three foot strip for the binding. The binding was applied wet so that it would tighten as it dried, the picture above was taken at this point. The big surprise for me was that as it shrank the rawhide also crept towards the thinner part of the haft with the result that it loosened it’s self completely. I have now just replaced the binding with tanned leather to rectify this problem. If this binding holds I will provide another photo to show the new method. The experiment goes on. 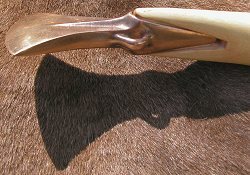 A bronze tool is often held up as a valuable piece of equipment because of the work needed just to produce the bronze casting. I think it is important to realise that the work did not stop with that bronze but carried on with the rest of the tool as well. It is very easy in our world of power tools to forget that patience was a necessity not a luxury in the past. Even trying to be faithful to my own standards I lacked the patience exhibited by our forebears by picking a saw on two occasions when I believe they would not have had that option. Now all I need is the courage to actually hit something with it.